Our name may be Alligator Alley, but our land serves as home to a diverse population of creatures. From bullfrogs to fox squirrels, we’re not your typical alligator farm. 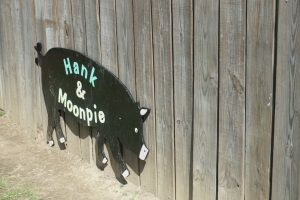 For the first time on our blog, we are shining the spotlight on some of our favorite farm friends: Hank and Moonpie! On the surface, the two may seem to be just regular old pigs. However, there’s a lot more to them than you may think! Hank is much older than Moonpie, and he has been on the farm for over 13 years. He was born on New Year’s Day 2004. 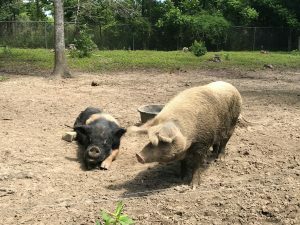 Originally, Hank came to Alligator Alley with the goal of producing offspring with his wife, Pepper. Sadly, however, Pepper passed away a few years ago, and Hank is now past his breeding years. In his old age, he loves to spend tons of time at the food trough and napping his days away! Retired life suits him very well. Moonpie is one of the newer additions to Alligator Alley. She has only been on the farm for about three years, and became the new girl in town after Pepper passed away. She keeps old Hank company and keeps him feeling young again! Both weighing in at a trim 500 pounds, the easiest way to tell the two apart is by their coloring. Hank is has a black body with a white belt, while Moonpie is all white. This color difference exists because they are two different types of pigs. 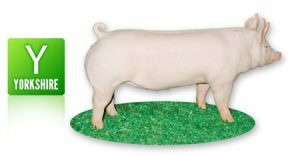 Hank is a Hampshire pig, the earliest hogs brought to America. They were first imported around 1825 from Hampshire County in England, and they are known for their proficiency and vigor. 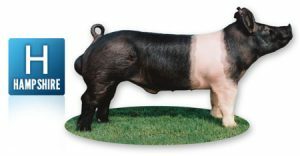 Moonpie is a Yorkshire pig, a breed that came to America not too long after the Hampshire in 1830. They originated in Ohio, but can now be found all over the United States. Yorkshires are known for being very productive and performance oriented, yet durable. Hank and Moonpie are two of our favorite animals on the farm. Not only are they fun to visit, but they also add a sense of a true, all-around farm feel to Alligator Alley! 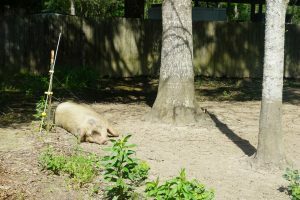 Besides, what’s a farm without pigs, chickens and alligators? If you want to come meet this month’s featured farm animals for yourself, come visit us today!